Sometimes you just need a quick, summery dessert-snack. And sometimes you have three peaches and one small package of blackberries sitting around. What else to do but make individual cobblers? In a small bowl, mix the peaches, blackberries, sugar, lemon juice, and cornstarch. Let sit for 10 minutes. 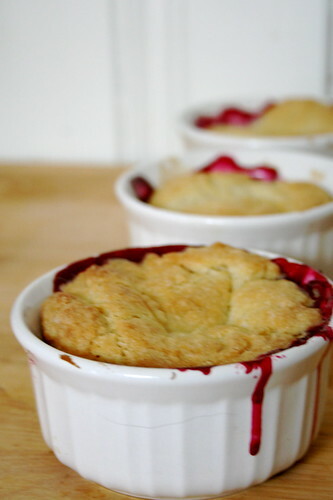 In three small Corningwear dishes, pour in equal amounts of the blackberry peach mixture. Place on a baking sheet and bake for 10 minutes. Meanwhile, in another small bowl, blend together the flour, sugar, cornstarch, baking powder, and salt. Using your fingers or a pastry cutter, mix in the Earth Balance until a coarse, crumbly meal forms. Pour in the boiling water, mix until just combined. Remove the blackberries/peaches from the oven, top with the biscuit batter, and bake for another 20-25 minutes or until the biscuits are golden on top. Let cool for 10-15 minutes, then enjoy! Ahh, quick yet classic & satisfying!! Anything mini or individual gets my attention These cobblers are so cute! Excellent idea! I love a quick fruity dessert in the summer. Jes, regarding your comment to Beth that you don’t know what to do with the extra food you cook: when Beth was in the Hollins program we found the other students more than willing to eat extra food – you’ll be voted most popular girl in your class for sure! How perfect, I love small-batch baking like this! Those sound so perfect for summer. I love peach desserts. Peaches are one of my favorite things about summer! Perfect summer dessert, Jes. Summer fruits rock! mm… that’s what I can do with my incomplete set of french onion soup dishes… mmmm…. Your lil’ cobblers look so tasty! They are screaming to be topped with a dollop of cashew cream or even a scoop of So Delicious Vanilla.